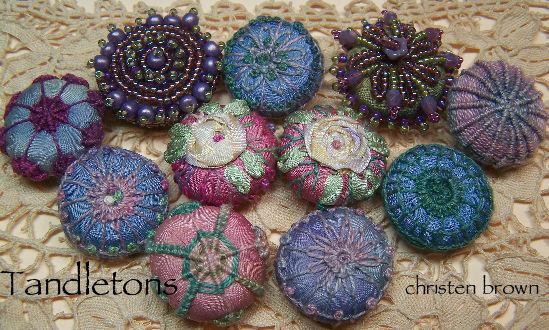 Tandletons=Tatted/needle lace/buttons. These little threaded works of art are just so much fun to make. I start with a base made from silk bias ribbon, stuffed with Polyfil. All of the stitches are created with a milliner’s needle, cotton and silk threads, silk embroidery ribbon or beads. The techniques that will be covered in class are Traditional Embroidery, embroidered Tatted stitches, Needle lace, Beaded Stitches, and Silk Ribbon Embroidery stitches. Skill Level Intermediate: hand sewing, embroidery and beading knowledge helpful. Lesson 1: First you will learn how to stitch the base that can be used for each embroidery technique. 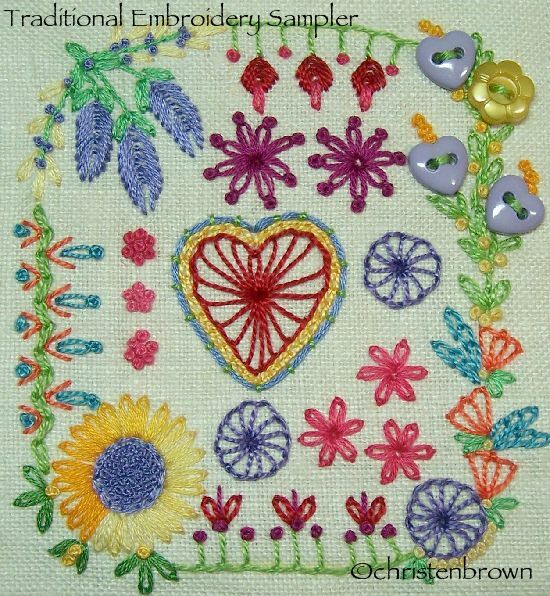 In this lesson we will cover these traditional embroidery stitches: buttonhole, chain, feather, lazy daisy and French knots; and the woven rose that is stitched with silk embroidery ribbon. 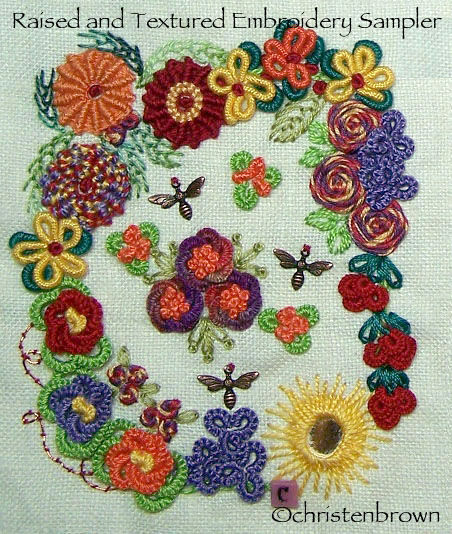 Lesson 2: This class will cover the embroidered Tatted stitches: basic, picot and twisted loops. Needle lace stitches: the woven star; buttonhole and twisted bar. 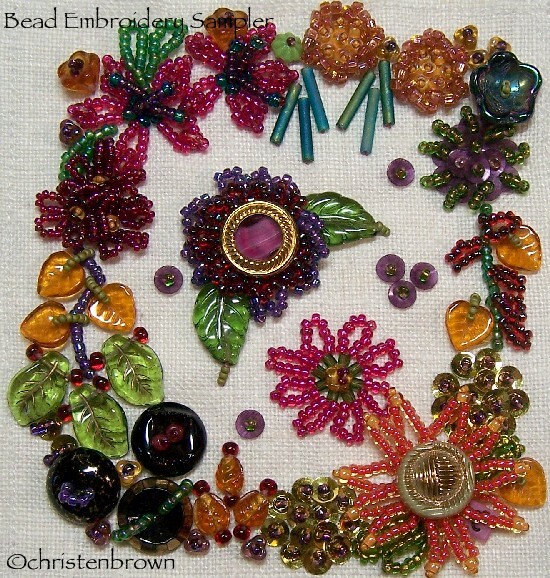 Beaded Stitches: continuous beading, single bead with detail design, stemmed beads, and flower petals. This class will also cover the basic finishing techniques. These bracelets are so feminine, pretty and dainty, and perfect for your spring wardrobe! 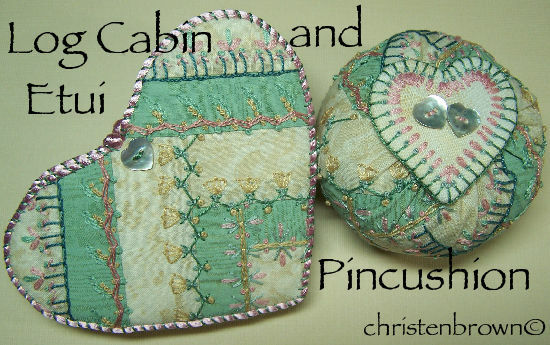 Each little beauty is made from a piece of bias ribbon that is first stitched and stuffed into a pillow shape. Each of these individual pillows is then embroidered with silk ribbon and embroidery threads, creating a rose, leaves and a vine. You have two styles of bracelet to choose from. The “Ring of Roses” is made up entirely of embroidered ribbon pillows, strung with beads and has a glass button for the closure. The “Band of Roses” is made from a ribbon base, covered in vintage ribbon with a few of the embroidered pillows stitched on top; a dainty embroidered button and hand-stitched button loop are the closure. Lesson 1: In this lesson I will cover the making of the silk bias ribbon base for the pillow shape. The embroidery stitches that will be covered are: the woven rose, the French knot, the feather stitch, chain stitch, buttonhole, and the lazy daisy stitch. Lesson 2: In this lesson I will cover the assembly for each of the bracelets. Ring of Roses will use beads and a button for final assembly. 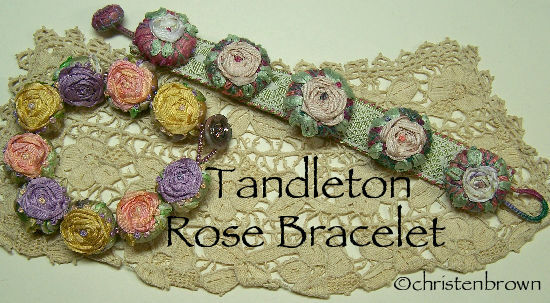 Band of Roses will have a stitched ribbon base, lace decoration, an embroidered button, and button loop. 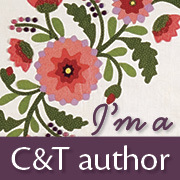 My new book Embroidered and Embellished is divided into the four categories of embroidery that I work in. 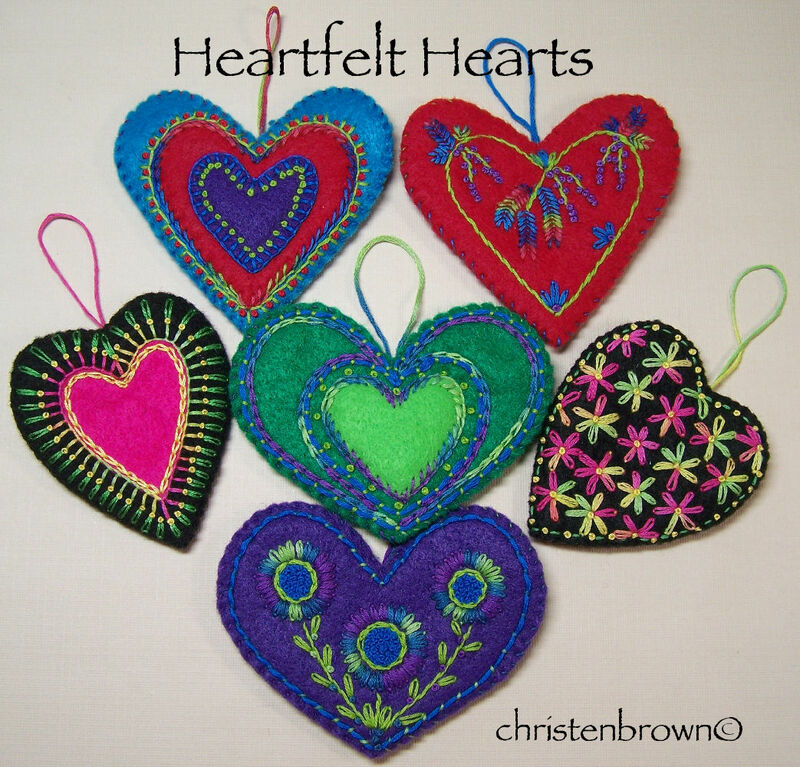 At the beginning of each chapter I have included a sampler which utilizes all of the stitches included in the chapter. Each of the embroidery chapters offers two projects, one small and one large. Quite a bit of thought went into each project. The small projects are designed so that the beginning student will get a feel for the art form, and still be able to accomplish something in a relatively short period of time. The larger projects were designed for those who have more experience, and are accustomed to a project that will take more time to complete. A gallery section has also been included, with many pieces both large and small. If you have purchased the book, and like it I would appreciate it if you could write a review on Amazon or C&T Publishing website. This richly illustrated reference guide from embroidery expert Christen Brown covers everything you need to make beautiful magic with needle and thread. Learn to sew traditional and silk ribbon embroidery, make raised stitches, and embellish with beads, charms, buttons, and mirrors. 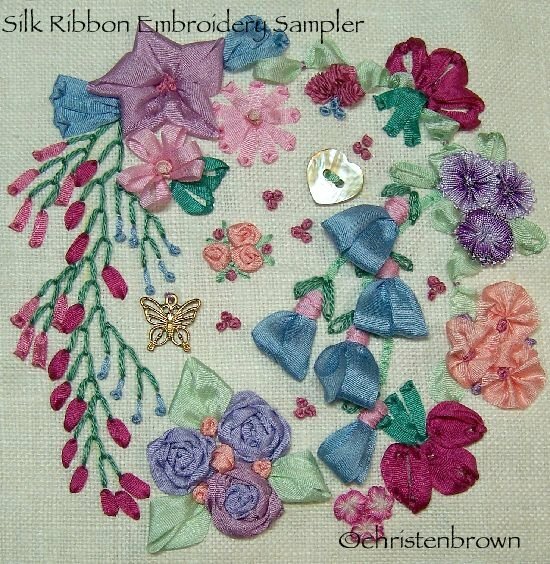 Christen shows you how to combine and place stitches to enhance a finished piece and how to work with embroidery threads, ribbons, fabrics, laces, beads, buttons, and other embellishments. My new book is now available through C&T Publishing.You can see a few of the projects here, on C&T’s Blog. I will be teaching several classes from the book this year in Houston at Quilt Festival in the fall, and next year at Road to California, in January. Here a few hearts that I have been working on. All of these were made from synthetic felt and cotton floss. In both of these groups I have worked with reverse applique, padded applique and pieced applique. The stitches are all done in traditional embroidery stitches with two or three strands of cotton floss.